Walk-thru & musical drama presentation. 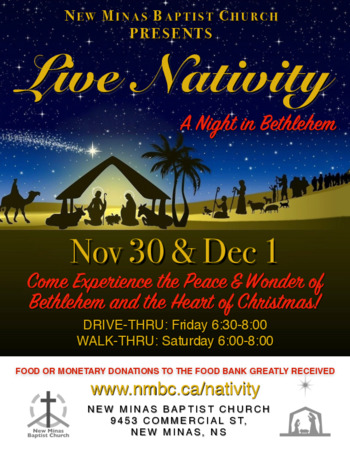 Join us for our 4th annual Live Nativity and experience A Night In Bethlehem. Three kings will greet you and point you to the star. Food or monetary donations to the Food Bank will get you past Roman soldiers and tax collectors. Villagers, Shepherds, and Inn Keepers will direct you to an Angelic Choir, Mary, Joseph, and the real star of Christmas, baby Jesus. Come be a part of this Valley-wide Christmas celebration!